Entries for the Hoard will be accepted until the last day of March, 2018. Such an interesting and awe-inspiring topic. All the kami's of Shinto, Tao and Buddhist traditions. The folklore. The temples and shrines. Priests, monks and followers. 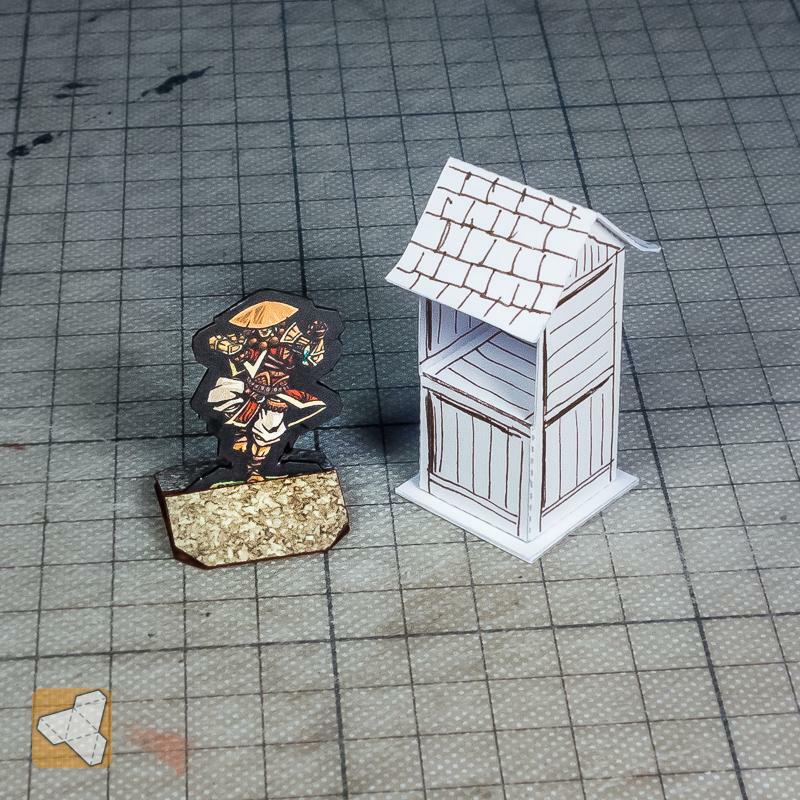 Started working on a wayside shrine ... maybe a mini maker wants to draw a little kami statue for inside? 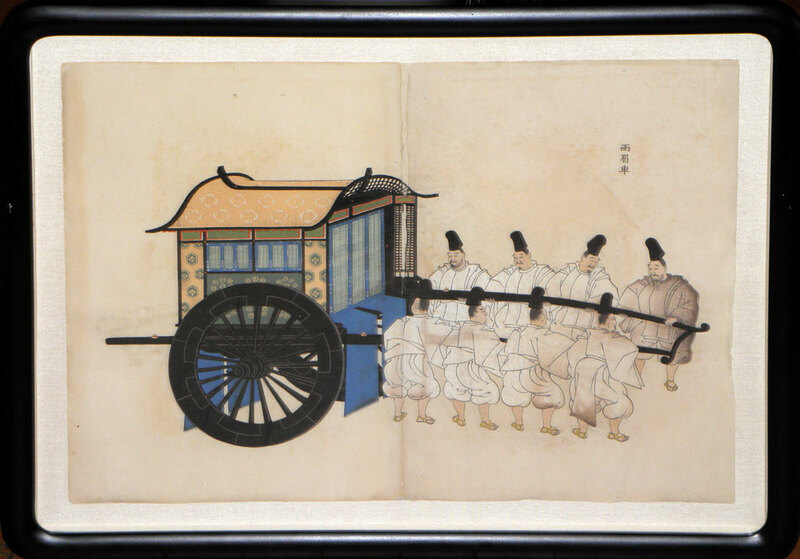 If you do a search for 'kami woodblock print', you might find an old image that you can modify. Had some time today, so I went on to complete this. You can turn the moss on the roof off, but I like it! Man, I can't give that shrine enough love! Vermin King: I am surprised you aren't building this cart already. Gotta finish Cthulhu. And then work on the February Hoard. I grabbed some of the old woodblock prints of the Seven Gods of Fortune. If I get them cleaned up and laid out, would you feel like doing backs? Sure, I can probably do backs. The goshugorama looks like a pretty straightforward project. Instead of a smooth curve for the roof extensions, I plan on doing them like baseball cap bills that connect under the front and rear roof edges. The rest of this is fairly straight forward. Found an old print of someone exiting one of these, which gives me a back end view. I thought I would pull a madarchitect and go through some old wood prints of the Seven Gods of Fortune and maybe some demons, but this may be more difficult than I thought. Here is the template for this month's hoard. Do we have more ideas working? Seven Gods of Fortune are driving me up a wall. The styles between artists do not blend well, and it seems that each vintage woodblock print has three, five, six good images. I can't really find seven that look somewhat unified in style. As far as ghosts, demons and ogres, the older prints look too cute or poorly executed. Some of the meaner looking demons are the cat demons. Not sure I want to do a cat head in clouds. Why is it that the best images to be found are either on beer labels or tattoos? Who cares? Is this an excuse to drink beer? I will take any excuse to drink beer. Strangely, that has never led to tattoos for me. Sorting through this has been interesting, though. There's a vintage model called 'Dance of the Gods at the Heavenly Gate'. A beautiful model, but I didn't realize that it depicted Shinto Gods dancing to lure Amaterasu the Sun Goddess out of a cave to end an eclipse. The ancient Japanese have an interesting perspective. Instead of showing demons and evil spirits in their power, they usually show the mighty warrior defeating them. Demons in their death-throws does not make for a good mini. They also like showing them in mortal guise doing normal things, like sitting around drinking. So, guys sitting around drinking doesn't seem like it would make for good minis either. One shouldn't have to explain that this is a deity disguised as a human. Found another good Shishi or Komainu. 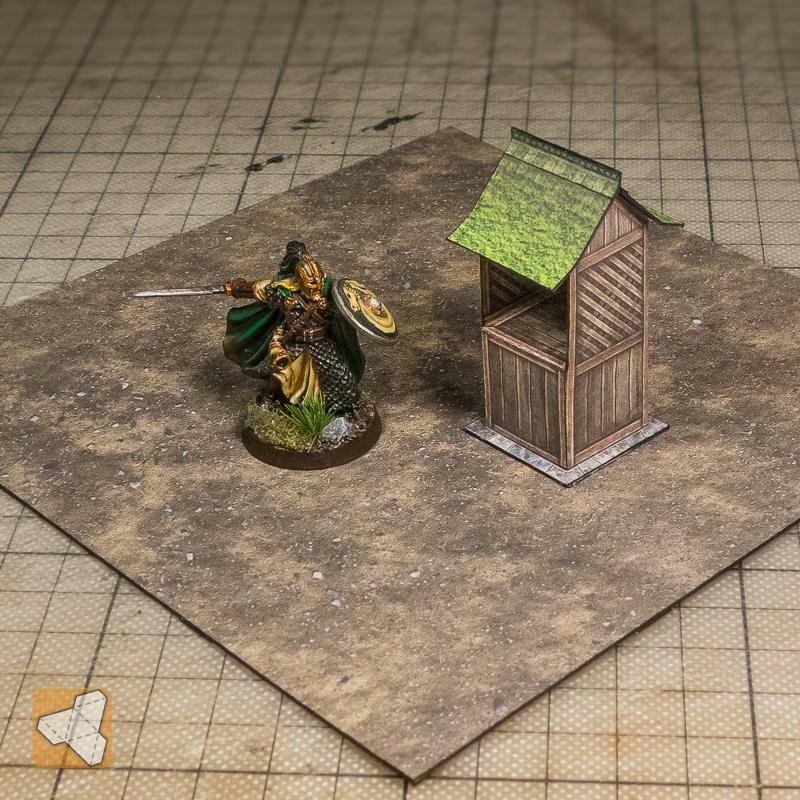 Well, with immaculate timing, Eddnic has just (March 7) released a fresh batch of minis - wait for it! 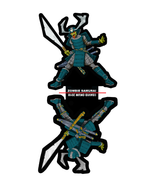 - Paper Miniatures inspired by Eastern myths and legends! Yay! Samurai Zombies in puppetland! Demon is hidden in coastal reeds and bulrush, waiting for careless wanderers! So it's rather kinda props or element of scenery than playable figurine? Dunno if such mini will be suitable? Worth working on this further? And oh... bulrush, water textures and effects are temporary, just for preview here. I think this is a great idea! Could the demon be one piece and the bullrushes separate? Maybe on a watery base? I also think it would be fun to make each arm and head separate pieces and large so the encounter would be fighting a mostly submerged giant. These take a bit longer than the beasties. The beasties were generally shown by themselves or in very simple scenes to delete. These guys are mostly coming from one of the three panels of a triptych. I haven't found a good system for pulling them out, adding borders and cleaning up artifacts. <...> Could the demon be one piece and the bullrushes separate? Maybe on a watery base? I also think it would be fun to make each arm and head separate pieces and large so the encounter would be fighting a mostly submerged giant. Yep why not - but... then it would become a whole mini-set as these components will make up 2-3 pages - and it was supposed to be one simple and quick "joke" mini. Well I'll consider the idea of ​​such a MOD-KIT or rather more complex DIY set, but for now maybe it may be better to leave it as it is. If it is OK mesper, I will try to do a mod for this hoard. If it is OK mesper , I will try to do a mod for this hoard.